The Treaty of Accession 2003 was the agreement between the member states of the European Union and ten countries, concerning these countries' accession into the EU. At the same time it changed a number of points which were originally laid down in the Treaty of Nice. The treaty was signed on 16 April 2003 in Athens, Greece and it entered into force on 1 May 2004, resulting in enlargement of the European Union with 10 states. The European Space Agency (ESA) in was founded in 1975 when the European Space Research Organisation (ESRO) merged with the European Launcher Development Organisation (ELDO). The ESA Convention was signed by the ESRO and ELDO members on 30 May 1975 and by Ireland on 31 December 1975. Canada signed a Cooperation Agreement on 9 December 1978. The Convention entered into force on 30 October 1980 after the ratification procedures in the 10 ESRO/ELDO members were finalised. 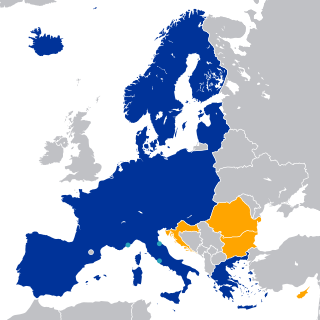 The Treaty of Accession 2011 is an agreement between the member states of the European Union and Croatia concerning Croatia's accession to the EU. It was signed on 9 December 2011 in Brussels by the heads of state or government of the 27 member states and by the President of Croatia, Ivo Josipović, and Prime Minister Jadranka Kosor.